AC Newman with The Broken West screen printed poster. 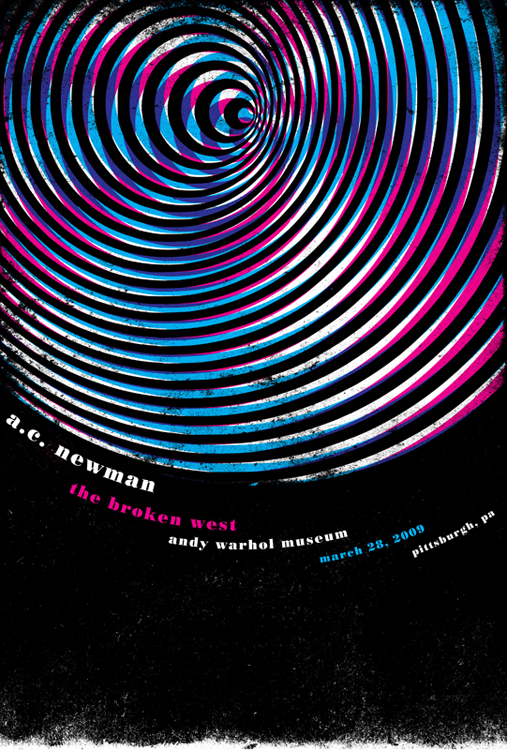 Hand silkscreen printed poster for AC Newman’s show on Saturday, March 28, 2009 at The Andy Warhol Museum, Pittsburgh, PA.
4-color, all hand screenprinted poster with black, magenta & cyan inks. Overprint magic makes a pretty luscious violet. Edition of 150 Size: 16w x 22h inches. Paper: archival Cougar 100 lb White, cover weight.